On this 9km family friendly Great Wall trip we follow the Gubeikou Great Wall wall as is winds trough the landscape on top of the mountain ridges. Big draws for this Great Wall trip are the fantastic scenery of one of the best preserved section of the will great wall. A great lunch and a dinner that should be awarded with 2 Outdoor Dinner Michelin stars and a home stay surrounded by the Great Wall. For this Great Wall section we will drive out to the border of The Beijing and Hubei province. It is a 100 km drive that will take us about 2 hours. Our arrival point is a small folk village where we will start with a really nice country side lunch. After lunch we will follow a small trail for about 45 minute hike between the fields and trough the forest and up the hills until we arrive at the highest Great Wall watchtower of the Gubeikou Great Wall. This view from this General Tower is the first highlight of the day, a painting like view of the great wall winding over the mountain ridges as far as the eye can see. On nice weather days we can see the whole Gubeikou great wall, the Jinshanling Great Wall and even the Simatai Great Wall. .
From this watchtower on we will walk on top of the great Wall for about 3 hours passing numerous watch towers and beacon towers all the way till we reach the camping spot. The Great Wall and it’s famous towers are very well preserved and still in original state. There will be plenty of time for breaks and pictures at excelent viewpoints. From the rooftop of the last watch tower of our hike we will be able to see our camping spot. A nice flat grass field next to and surrounded by Great Wall . With a view on 2 sections of Great Wall we can watch the sunset enjoying a nicely cooked dinner and glass of wine. .
Next day after breakfast we will have a short hike down the wall into the valley where our driver will be waiting for us. It will be a memory you will treasure for a long time. Around 12.30pm we will arrive back at our meeting point. .
un esperienza fantastica, un mix superbo tra divertimento , professionalità e scenari fantastici. 10月中的古北口長城特別美麗, 紅葉特別多. 因為考慮到夜晚較冷, 所以這次我選擇兩天一夜住農家院的行程(7月來時是露營). 比起夏季, 秋天健行涼爽舒適; 只需帶一件輕羽絨外套備用就夠了. Hiking with Fred and Heidi was a wonderful end to an altogether amazing hiking and biking trip around China. We planned our trip to alternate time in Hong Kong, Chengdu, Xian and Beijing with Hiking and biking trips interspersed. Our hike was a wonderful antidote to the hustle and bustle of the city. Pick up and transfer to the trailhead went smoothly, safely and comfortably. The farmhouse lunch they organized was delicious and our hosts were so welcoming and hospitable and finally, the hike along the unrestored section of the great wall was breathtaking. So much better than the crowded, commercial trip to one of the restored sections that my son's University organized. Fred and Heidi were organized, friendly and thoughtful we would love to walk with them again! 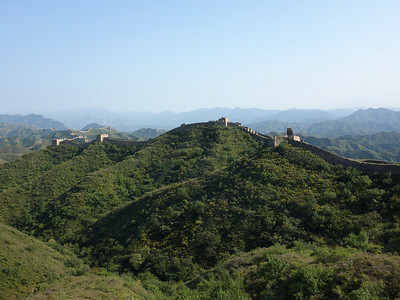 I was absolutely enchanted by the tour to the Great Wall with Chinahiking. First of all I loved the fact that we went to a less (none) touristic part if the Wall which was majestic and allowed us to fully enjoy it. The orgaznization was perfect! Always a back-up plan (we couldn't camp because of lightning, but Fred & Heidi had a farmhouse planned to welcome us instead). Meals were excellent and a vegetarian option was presented every time. They were open to slight changes to the tour to accommodate us and therefore provide the best experience. No extra mandatory visit to shops or local business. And as far as I am concerned Fred &Heidi helped me afterwards to organize the rest of my trip and I will for sure go with them on another tour again. I highly recommend Chinahiking!!! I really wanted to camp on the wall and spent several days looking for companies that could do so. After getting very frustrated dealing with Chinese companies with half answers and extortionate prices I stumbled upon Dandelion Hiking. Fred was quick to put my mind at ease and answer the many questions I had. After a phone call to some villagers he confirmed it would be too dry to camp on the wall and sit around a bonfire but that a local farmers house would be just as unique. On the day Fred and Hedi were really friendly not just telling us about the area and the wall but things to see and places to go making the most out of our last few days in Beijing. The wall was fantastic...we saw the really old, the not so old and recently restored. Other than our group of 10 we saw 4 other people- 2 slightly lost tourists and 2 old ladies standing in the sun with a job to sell tickets. I'm surprised that this part of the wall even needs ticket's. The 'farmhouse' wasn't the outback tent or run down thatched barn I had romantically dreamed up but oh well!....It was warm, clean and comfortable and the breakfast lunch and dinner was delicious. This much expected 2 day trip with our visitors from overseas turned out as un unforgettable experience for our 3 families of friends with kids. Fred and Heidi took care of everything, transport, itinerary, catering, water, based on our request, and offered us an amazing view on a part of the Wall less travelled on the Panlongshan section on the first day and a nice stroll at Mutianyu on the second day. The mists on the flower covered mountains are an unforgettable sight. So was the one night stay at a very warm and welcoming guesthouse, with traditional heated beds and great food (and beers). The adults had a great time, with our cheerful and knowledgeable guides. The kids (aged 2 to 10) have been delighted and overall safe wherever we were. The hike in itself was not physically challenging, except for those with a fear of heights. I would definitely recommend checking first your level of comfort on steep stairs with steep cliffs on both sides and a view on your kids running ahead on a narrow high path or climbing crumbling watchtowers. This was not comfortable for everyone but all of us turned out happy after the stay for all kinds of reasons. Thank you Fred and Heidi ! We really felt like guests on the Wall, not like visitors or tourists. Looking forward to travelling back and maybe camping once the kids are older. Fred and Xiaohong (Heidi) took us on a wonderful hike of a deserted section of the Great Wall including an overnight stay at a local farmhouse. It was a great relief to get away from other tourists and the big city and take on a vigorous hike in a natural setting. No trinkets, souvenirs, or gift shop - just authentic stones and millennia of history. Fred helped bring the history alive with descriptions and explanations. He and Xiaohong adapted the hike to our interests and abilities - in fact we went further than expected - about 10 km - just because we were having such a great time. The farmhouse stay was quite special; it felt really authentic. The hostess prepared an extravagant array of dishes - several from their own garden. The beds were clean and heated from underneath. Our teenagers enjoyed it and left this humble setting with a different perspective on their suburban upbringing. Fred and Heidi could not have been more helpful and thoughtful . This was a really great way to see the wall. They agreed to take us to the wall despite the forecast being for lightning but were sufficiently concerned for our safety to book us into farmhouse accommodation instead of camping. We banquetted on dragon boat specialities made with local foods. We saw perhaps 4 other people in total on the wall during the walk and were allowed to set our own pace and make route decisions given alternatives. Heidi was able to tell me the local uses of some plants and because we had a birthday on the trip she had bought a beautiful present as a gift. There was plenty of time for photography and soaking up the atmosphere. I would recommend these guides without reservation. We renewed contact with Fred and Heidi for a family visit. It was just as great as the previous trip, with incredibly lovely weather on top. Fred and Heidi squeezed us in a very busy schedule and even arranged the hiking plans last minute to accommodate the needs of our toddler and our 5 year old who had suffered a bad ankle sprain the previous days. The whole itinerary was arranged so that all family could enjoy the hike from different parts of the wall more or less challenging and meet in the middle. We had a lovely and quiet stay in the farmhouse while the rest of the party camped not far away. Food was fantastic. Company was cheerful and relaxed. I cannot recommend you guys strong enough and we are already looking forward to the next trip ! My impression and review of Dandelion Hiking is NOT solely based on beautiful scenery and fantastic weather; any tour company can research sites to visit and luck out on good weather. My review is based on Heidi and Fred as people and what they had to offer. A little background information on us may shed more light on our perspective and hopefully give you a better appreciation of Dandelion Hiking. My wife and I are very experienced independent travelers. Not only have we visited 6 continents we have lived and worked on 4 of them. Our 2 daughters age 6 and 8 are not going to stop us from exploring. First and foremost I found F & H to be reliable, honest and trustworthy. Imagine trolling the internet in the comforts of your home trying to find a reasonably priced tour operator in China. Or worse waiting till you arrive in China to find one. Good luck finding guides or a tour company that is not just in it for the money. What you will find is that ALL the other operators will inevitably drag you through some silk or jade shop were you and all the other people in your "small" group of 50 are left for an hour so that you can shop. GREAT ... just shoot me now!! Forget the fact that Fred speaks fluent English, French, Flemish, Dutch and that Heidi speaks Chinese and her English is very good; what distinguishes Dandelion from the rest is that Fred is from Belgium and Heidi is from China. So as a team they can bridge any and all cultural gaps between East and West. In other words... nothing is lost in translation. When I was booking with Fred 3 months in advance (WITHOUT having to pay a deposit) I KNEW that he would be at our arranged meeting spot. I WAS CONFIDENT that he would be on time if not early! I TRUSTED that the farm house we stayed at next to the Great Wall would be safe for my children. THERE WAS NO DOUBT! I HAD NO WORRIES that the amount I paid was the price that we agreed on. I mention all of this because through our travels we have experienced it ALL. Visit their web site and the pictures they have posted are truly representative of what you will see and experience. The beauty of Dandelion Hiking is that they will deliver an experience which you will never forget!!! My name is Ken, I’m from Ireland. I came to Beijing in 2006 to Learn Chinese and got acquainted with Heidi through doing language exchange. I have proved Heidi to be an honest and reliable friend. Two years ago Heidi started her own tour guide business, taking people to wild parts of the Great Wall, countryside, Desert trails etc. Unexplored by foreigners as we would never be able to find or go without the help of a local. We joined many of her excursions and found them very enjoyable, safe and inexpensive. All of her excursions are to places where she has gone in advance and investigated the area, finding the best routes, locating local country homes where you can rest a while and enjoy eating local food, or stay overnight. I often have friends come to visit me in China and now that I live and work in Qingdao its not always convenient for me to accompany them site seeing in Beijing, many of them have gone on excursions with Heidi and all have been very satisfied.